Annika Allman (Vital Voices Uganda): A Jamaican-Canadian, Annika earned her Bachelor’s degree in Social Development Studies from the University of Waterloo. As an undergraduate student, she acted as Administrator for the Guyana Red Cross Society's Children's Convalescent Home. She has also worked as a policy analyst for the Canadian International Development Agency. At the time of her fellowship, Annika was pursuing a Master of International Affairs in economic and political development, and interning at the Women's Refugee Commission. 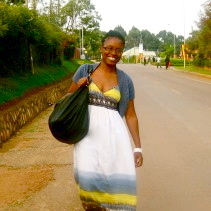 After her fellowship, Annika wrote: "I will be more sensitive about the way I think and speak about Africa and Africans. Second, I will be more connected to the world. This has boosted my confidence tremendously. The openness and appreciation (of my hosts) helped me change the way I see myself, my value and my capabilities." The last profile I’ll share here is that of a restaurant owner based in Kampala. Omwami kyakoba zena kyenkoba – What my husband says, I follow. recently travelled to Jinja, Uganda’s second largest city, to meet members of UWEAL’s Jinja arm. Prior to my meetings, I was repeatedly told that women in Jinja enjoyed less financial freedom than her average Kampala counterpart. From her home in one of Kampala’s poorest neighbourhoods, Benedicta Nangoya has adapted an ancient Buganda custom and turned it into a livelihood, a public service, and a niche.